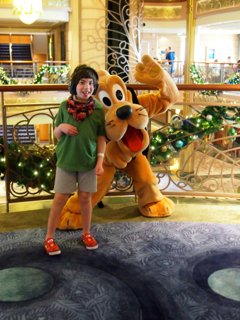 Disney Cruises and kids with special needs: Max gives them a big thumbs up. 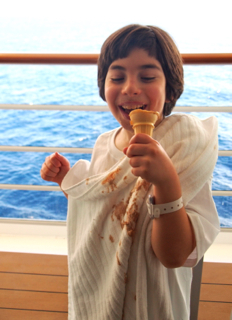 Yes, we all seriously enjoyed our cruise on the Disney Fantasy, but Max was in his own heaven; he's been talking about the trip literally every single day for the half year leading up to it. Even while we were on the ship, he was already plotting his next visit. Our cabin had a photo of the four Disney ships—The Magic, The Wonder, The Dream and The Fantasy—and Max would point to The Dream and stare at us, expectantly. I told him he could start saving up for it! 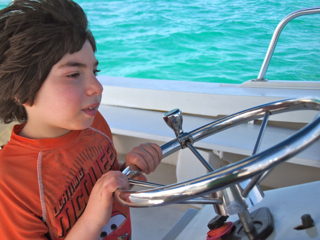 Our Caribbean cruise was seven nights long, a good amount of time for Max to settle in and feel comfortable; like many kids with sensory issues, once he's familiar with a place, he's more willing to explore and try new things. This is the Disney Fantasy's first year of sailing; we were cruise #40. 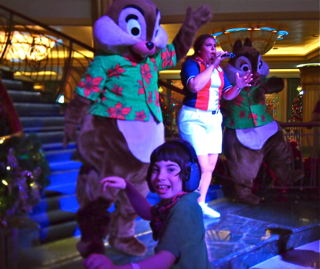 These were our experiences on the ship, plus some other scoop on Disney cruises with kids who have special needs. The staterooms are compact, but well laid out. The couch converts to a bed, and another drops down from the ceiling. We got a room with a verandah, which costs more but makes the room feel more spacious (rest assured, the verandahs have plexiglass as do all railings, so no worries about kid overboard). There's a small fridge in the room, where we kept Max's anti-seizures meds, along with the chocolate milk cartons he hoarded from the breakfast buffet (shhh, don't tell). Every room comes with two Wave phones, helpful for staying in touch with staffers at the kids clubs. And there's a Health Center, with nurses and doctors, just in case (though if you have specific medical concerns, you should call in advance). 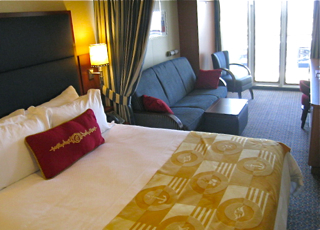 The ship has 37 accessible staterooms and suites (here's a review of one and a video of one). 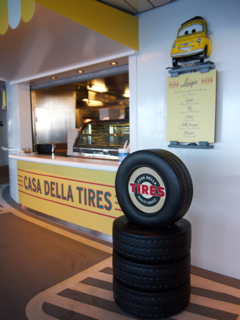 Guests could request bedrails, raised toilet seats, shower stools and more. Decks are very spacious and doorways wide, with many opening automatically. The restaurants are easily accessible. Theaters have dedicated viewing areas for wheelchair users, and offer assistive listening devices for performances; transcripts of shows available at Guest Services. 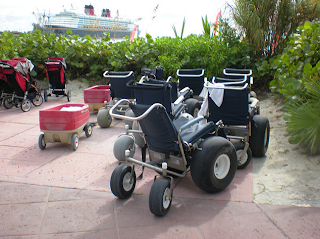 On Castaway Cay, Disney's private island—of course Disney has a private island!—there was a tram, plenty of paved pathways, sand wheelchairs free of charge and accessible restrooms. We chauffeured Max around in a wagon. (For the complete Guests with Disabilities list of offerings, click here). On our previous cruises, the Disney Cruise Line Terminal—in Port Canaveral, Florida—was super-crowded, which wigged Max out. Now that Disney has instituted timed boardings (you select a port arrival time when you do on-line check-in), the scene was much more chill and we breezed through. Crew members standing in the lobby of the ship announce each guest, and so if your child doesn't like loudness you can just tell them not to say a thing, as we'd done before. This time, though, Max told me he wanted them to say "Yay, Max!" and clap, and they gladly obliged. Then they said "Welcome, Sabrina!" at her request. And then, Max wanted them to say "Yay, Max!" again and clap, and they did. Max likes his standing ovations. The ship is tremendous (there are 1250 staterooms), yet even though there were some 4000 passengers onboard our cruise (and 1400-plus crew), it really never felt crowded. We came armed with noise-blocking Sperian headphones, and they usually kept Max secure and calm. There are occasional stateroom announcements that aren't too loud, all preceded by the openings notes of "When You Wish Spon a Star." Max loved that tune, and now, he asks me to hum it to him at bedtime. A crowd tends to build outside the restaurants during seating times (there are two: one at 5:45, one at 8:15). As it turns out, the only thing you miss if you arrive a little past your seating time is...the line! 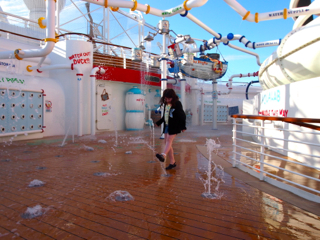 Before our cruise, I'd put in a request to be put in an area that was out of the fray, and that helped. Animator's Palette has some amazingly cool tech activities, including one where drawings your family makes become part of an animated cartoon they show on screen; Max was wary of that, and so we did room service with him that night before dinner and let him hang in the kids club. We were on the cruise Christmas week, and they had several big lobby celebrations, including visits with Santa and a Children's Choir. 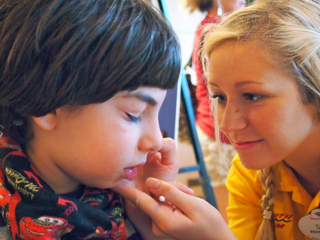 These were packed events that may overwhelm kids with sensory issues. 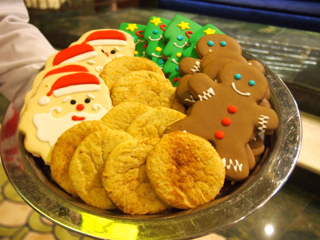 If you wander through the lobby early Christmas morning, though, it's near empty—except for smiling staff greeting you with hot chocolate and holiday cookies. For breakfast and lunch on the cruise, you can take your pick of dining spots. We usually did the breakfast buffet at Cabanas, and grabbed lunch from one of the casual eateries. For dinners, you rotate between three restaurants according to your assigned schedule; we had the same waiter, Ciao, and assistant waiter, Lucio, for all dinners. This was great, because they were both super-friendly and also knew to have chocolate milk for Max and all our drinks ready and waiting for us. At the first dinner, Ciao asked about any potential allergies; I told him Max had an aversion to nuts and homework. 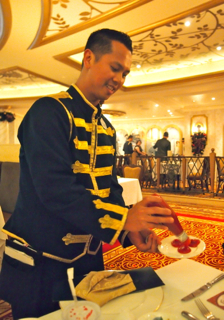 Max was a little nervous about settling into the restaurant on the first night, and Ciao helped calm him down by making him a ketchup Mickey Mouse. Score! Max is still impressed when I do this at home, though I don't know how long that will last. Max ate a whole lot of mac 'n cheese on the cruise. When he wanted to eat in the kids club, we just arranged with Ciao to have his meals delivered there. Several times we ordered room service, which had a good amount of offerings and came surprisingly quickly. I can't say enough good things about the Oceaneer Lab and Oceaneer Club, both for kids ages 3 to 12. Staffers were beyond accommodating. What's new about this ship (and The Dream) is that the clubs are connected, so kids can go back and forth between them, and also have lunch and dinner there. Max particularly liked the Club. 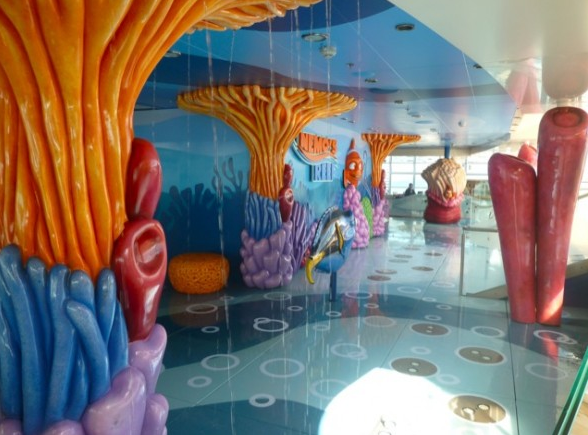 There are four themed areas: Andy's Room (Toy Story); Monster's Academy (Monsters, Inc.), Pixie Hollow (inspired by the Tinkerbell movies) and Explorer Pod, where kids can hang out in a Nemo-inspired submarine with computer stations. Can you guess which room this is? Ding, ding, ding! 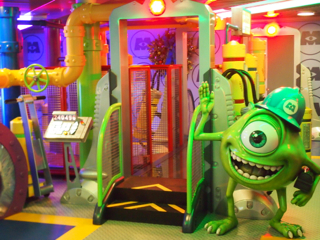 The Lab's themed areas include a media room (with bean bag chairs for watching movies or reading), Animator's Studio (for drawing or learning to sketch Disney characters), Sound Studio and Craft Studio. 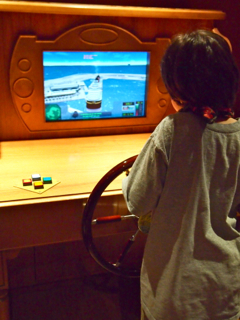 Max's fave was The Wheelhouse, where kids could steer a ship in a Pirates of the Caribbean video game. He had a blast when the Oceaner Lab had a Piston Cup Challenge in which kids designed their own race cars. Before we registered the kids, I spoke with Andrea, the Manager of Youth Activities. I wanted to make sure someone could help keep an eye out on him, help him with coloring or other fine-motor activities, and also assist at feeding time and with the potty, since pulling pants up and down is a challenge. Andrea actually remembered Max from our last cruise! 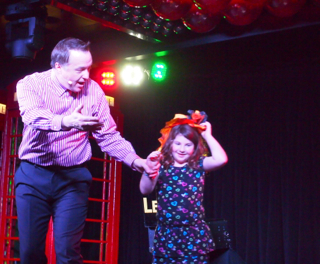 While there is no guarantee of a one-on-one ratio for a child at the club, things worked out. We never once got paged to help with the potty. The staffers were amazingly warm, cheerful and friendly; by the end of our cruise, every one of them greeted Max by name. A note about potty training: The official Disney site notes that the kids clubs are only for potty-trained children; this is because crew members cannot change kids. On our previous cruises, we were given pagers and Dave or I would show up whenever Max had to be changed. 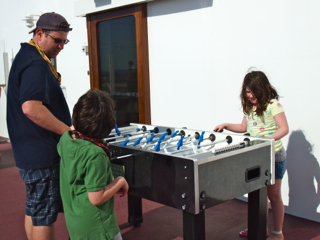 Basically, the kids clubs were a fantasy come true for Max and Sabrina and us, too; it isn't always easy to find clubs so accommodating to kids with special needs on trips. Sunday morning, Dave and I had brunch at Palo, one of two adults-only restaurants (it's best to book it months ahead of time). 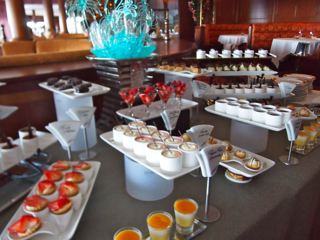 Hel-lo, dessert station! 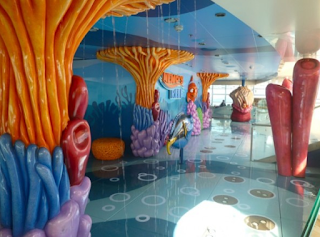 While the kids are in good hands, you're free to take a class (like one for tasting or folding towels or yoga), go on a guided tour of the ship, play trivia games, listen to live music, hit the spa or just loll around, perhaps on the wonderfully serene adults-only deck on Deck 14. I chose lounging! There are dozens of activities to choose from every day. You get a "Personal Navigator" newsletter delivered to your room the night before that lists all the offerings. I'd brought a highlighter and we marked the stuff we wanted to do. Max liked the family dance parties; the music was loud, but he had his trusty headphones on and he got to dance his heart out with the characters. The Family Crafts events, like card making and create your own tote bag, were not that crowded and Max really enjoyed them. Another great activity for kids with special needs: The Midship Detective, an interactive game kids can play on their own timeframe. Basically, you get a card with a special bar code that you hold up to video terminals on different floors for clues to solve a mystery like finding stolen puppies or missing artwork. You can do this whenever you want (it lasts 90 minutes, total) and is a nice, quiet activity. 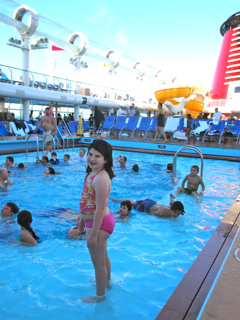 There are three freshwater pools on the ship; early morning and before dinner are decently non-crowded times to hang in them, but port days are the best (ditto for other activities on the ship). The Fantasy has a non-permanent pool lift (a mechanical arm) available in the family pool area jacuzzi on Deck 11 (it's not yet available in the pools), as well as in the Quiet Cove pool and jacuzzi (for adults); you should request it in advance when you book. Even if your child is wary of the AquaDuck water coaster (a flume ride inside a large tube), he might be content to just watch it, as Max was. There are three big shows on the cruise every day in the main theater; we saw Aladdin, Disney Believe (with lots of character appearances) and Disney Wishes. There are also other variety shows, like the performance team Buckets N Boards and a hypnotist. Max has only seen a live theatrical performance a couple of times because the volume is too much for him, but given his love for the characters he could not resist those big shows. The two of us stood behind the back row and watched; he was mesmerized. People dress up for Pirates of the Caribbean night (plenty of kids brought costumes) and party on the deck; that was too much for Max to handle. He was more than happy to hang it in the room and watch Cars On Demand, which offers a whole bunch of Disney movies free from classics to newer ones. The cruise also has screenings of current movies; Sabrina and I saw Wreck-it Ralph in 3D, and one evening Dave and I saw Lincoln. One day Max got brave enough to venture into the movie theater, stand on the side on watch part of Monsters Inc. in 3D—a major breakthrough for him. That's one of the great things about vacations for Max: It encourages him to break out of his comfort zone. Guests form lines to see princesses or characters (and Max wanted to see as much Mickey, Goofy and Donald as possible). They can get a little long but they're usually calm; the mid-ship ones on the 4th floor, by the Vista Café, tended to be a little less populated than the ones in the lobby. A photographer and staffer stand by the characters to take photos you can purchase, and snap ones for families. Max would only stand right by the photographer, mesmerized by Pluto, Goofy, Mickey, whoever. The head of the character team told Dave and me that one of us had to wait in line to hold a spot. This was a challenge because it was often just me and Max waiting to see a character; I knew if I went to wait on line and left Max, there was a good chance he'd make a beeline for Mickey and crash other people's photos. We did the best we could: We arrived early to avoid lines, or stood around after a character left so we could be first for the next one. A couple of times, a cast member waited online for us. If there was one thing Max would have changed on the cruise, it was the standing-around-waiting part. He has decent stamina but the cerebral palsy makes his muscles fatigue easier than other kids, and sometimes at night he'd trip and fall when his legs gave out. As the email I got from a Guest Communications supervisor after the cruise noted, "For guests with stamina concerns, usually alternate areas or wheelchairs are available." Neither would have worked for us, but it's good to know. Of course, we could have chosen to cruise during a less busy week, too, as we've previously done. I'll tell you what would be amazing: If the cruise had dedicated character viewings for kids with special needs. Perhaps in a room, with dim lighting and seating areas. And cocktails for parents! Yeah! The ship docks in Grand Cayman, Cozumel, Costa Maya and Castaway Cay. You can book excursions through the ship; I made a couple of our own. 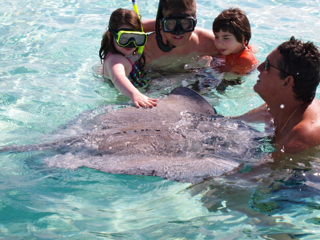 Max decided to stay onboard in Cozumel but in Grand Cayman, we did a Stingray Sandbar excursion through Native Way Watersports—fascinating and memorable. Co-owner Sharon, who picked us up on the dock, could not have been nicer; after the trip she even took us to get smoothies. (She also offered to let me come crash at her house should I ever have a mid-life crisis, which I will definitely keep in mind.). 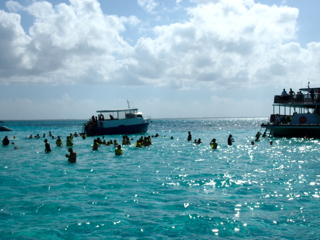 We took a 20-minute speedboat ride to a sandbar that's about 100 yards wide, with stingrays galore. I didn't know how Max would actually feel about it but he couldn't get into the water fast enough to check them out. Hanging with a stingray; we even got to feed it squid. Max suggested he might like mac 'n cheese. 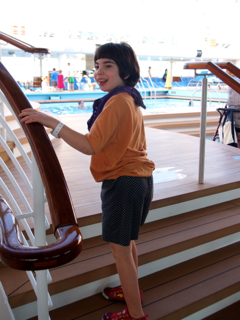 If you have questions about cruising with a child who has special needs, call the Disney Cruise Line Special Reservations Line at (407) 566-3500, press 1 and take it from there. Oh, and have a magical day. This sounds like a dream come true. We are very hesitant to schedule vacations because my daughter just doesn't have the stamina of a healthy 3-year-old - and also has a special diet and medication schedule. It sounds like this kind of cruise may be a possible alternative! 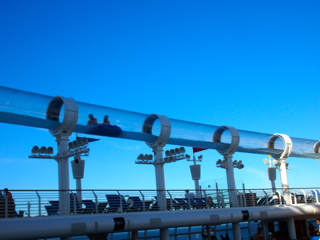 The beauty of cruising is, you can do as much or as little as you'd like! And, yes, it's easy to stay on a medication schedule. I hope you go! Wow Ellen the trip sounded amazing! 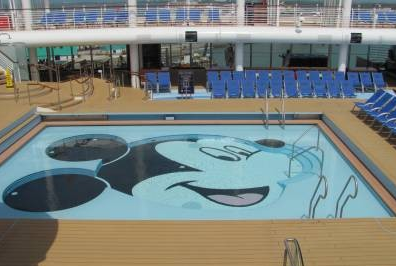 I have always wondered about the Disney cruise for cp kids. Your post is brilliant. Thank you! 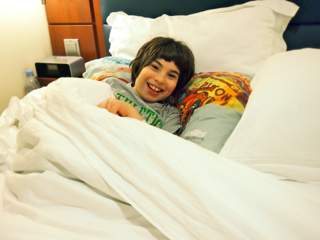 I know I always wonder about how trips are for kids with special needs, and I wanted to include as many details as possible (well, I could have definitely gone on and on but I know we all have lives to get back to)! Wow I feel like I just relived our cruise. I was so impressed by how many families had children with special needs on our cruise as well as at Disney World. Bravo to Disney for "getting" it. How amazing! 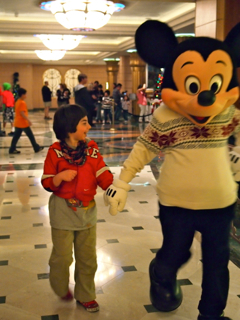 It is wonderful to see how accommodating Disney is with special needs kids. Our four year old was recently diagnosed with sensory issues and most of the activities would freak him out (crowds, water, probably even the characters) but it looks like so much fun I wish we could take that cruise. I am glad you all -- especially Max -- enjoyed it! Ellen - would the ship be easy to navigate with a wheelchair? YES. Definitely. It is truly accessible. I spotted several adults in wheelchairs and a couple of kids, and there were probably more because there were thousands of people on the ship and I definitely did not see every single passenger. Hi Ellen. So glad you had such a great time! We have 8 year old twin boys, one of whom, Jude, has Down syndrome. We would LOVE to take a Disney cruise. I am curious about the kid's clubs. Jude tends to be a bit of a flight risk. He is a master at watching for those opportunities where he might be able to slip out unnoticed. How secure are the clubs? Is there any way he would be able to escape? No kid could escape even if they were Houdini's offspring! The ONLY way out of the clubs are through the front gates, and they are secured. In order for a kid to leave, his parent has to be present and give a password. I guess a child could try to make a break for it if they were hovering near the gate and another child was leaving, but staffers really do keep an eagle eye on kids and of course, if you were to alert them to the situation they would keep an extra eagle eye on him. ALSO: Kids are given a special electronic wristband at the start of your cruise that contains basic ID info. They need this to be checked in and out of the club. It also monitors where they are, at any given point, within the clubs area (I don't believe it works as a tracker outside of them). Wow! Sounds brilliant! Thanks for sharing such a detailed post! Thanks for such a detailed review, Glad your family and esp Max had a good time. 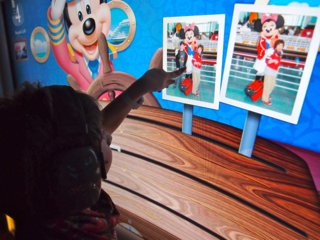 we crusing on the disney wonder next week and you answered a lot of the questions I had in mind about crusing with my 4 year old who also has CP. I feel much more at ease that it will be a good trip! I want to go to there!! One question, I noticed Max is wearing what looks like a track g device, is this what it is and was it issued by the cruiseline? I've noticed some cruises have a beeper or something to notify parents or have them come back to their kids. Did you do this or is max just wearing a watch? We are researching something similar for our daughter through our local police department and even a medical bracelet in case she wonders off. Yes, that wristband is able to track the kids within the kids clubs. The primary purpose is to ID them so they can be checked in and out of the clubs. In terms of counselors and parents staying in touch, on previous cruises the ship had given us beepers but now every stateroom comes with two Wave phones, and counselors were able to text or call us on those if necessary. A tracker bracelet for kids at home sounds genius! Let us know if you find one. In the county where I live they have collaborated with project lifesaver for the bracelets. Www.projectlifesaver.org. Ours is part of the sherrif office and they have to do a battery check monthly. The antenna can locate a mile radiusWe are going to get a medical bracelet and when my daughter is older and get her a bracelet when she starts public school and we have transportation to consider. The program has located over 2,000 people! I happened to stumble across this program and I don't think too many are aware of this great technology! Thanks for the thorough review! This sounds like a blast for Max, you, and future special needs kids. If you or Max (or anyone else reading this blog!) are ever interested any any cerebral palsy resources, I'd recommend taking a look at the Cerebral Palsy Family Network website. It's full of information and advice for all things CP. And I'm sure they'd love to hear your reviews as well! Anyway, thanks for blogging, and good luck to you and the family! This is a very thorough detailing of your first blog about your cruise for those of us who can only live vicariously through your amazing experiences such as ski vacations, trips to museums, and on and on. Don't get me wrong you and all of the families who live daily with special needs kids should have this opportunity as all deserve it. However, Ellen, most do not have the financial resources to do this type of vacation or ANY vacation. My granddaughter's 120 doctor visits last year plus all her many therapies leave no expendable cash for my son, daughter-in-law, and other granddaughter to vaca on a luxury ship to the Caribbean! It's sort of like an in your face blog sometimes and makes some of us moan. Am I happy for Max? Of course, just looking at his sweet smile brings a smile to all of our faces! Excellent question. I try to prepare as best we can. The month before we left, we'd had Max's blood taken to make sure he had good levels of his anti-seizure meds, so we felt secure about that. I knew they had a Health Center onboard with doctors/nurses (think about how many older people go on cruises—I figured they HAVE to have good medical staff). After the grand mal seizure Max had when he was two, I always carry a letter with me from his neurologist explaining to doctors what to do in case of major seizure, plus we have Diastat. I have dreams of taking the kids to Europe and I have definitely thought, What if Max has a seizure? But I won't let that stop me, For one, I'd call ahead and make sure I knew about local hospitals. For sure, I would still worry. But Dave and I both love travel and think the the kids learn so much from it, and so, we go for it. They have them on the boat. We also went on a disney cruise on the disney dream. We have seizures and a shunt and have a lot more walking issues than max does. We are in a adaptive wheelchair and we loved it. It looks like you had a blast! I had the same question about the kids' clubs others had since I have one who likes to bolt(I really and truly thought I had lost him forever a few months ago- one of the worst experiences of my life). So, it's nice to hear how secure it is! Oh, Shell, I can't imagine, my heart just dropped when I read that. Yes, he'd be safe and secure (and happy!) in the kids clubs. Looks like so much fun. And the smiles on your son's face. Priceless! Thank you Ellen for this detailed adventure with Max. I am a Disney Travel Planner (specializing in Disney World) but I have been hesitant about taking my son on a Disney cruise. 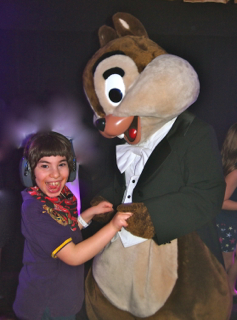 I know first hand about special needs in the parks, but after reading about Max's cruise, I am inspired to put a cruise back on my "must do" list for my son! I need to go buy a lottery ticket! That sounds like a lot of fun! So happy you had an amazing time. 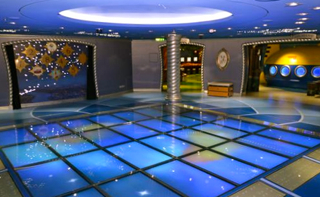 I've had the pleasure of cruising on the Magic and Wonder it was several years ago before Sophie was born. It was truly amazing although I would be nervous now to even think about putting her on a cruise ship. It's very comforting to know how accomodating they are but I should already know that as Sophie's Make a Wish to Disney was wonderful. We were thinking of going on a Disney Cruise. We were on one in 2008. They were horrible with our dietary needs for one of the children. The attitude was simply don't let her eat that. No mention of alternatives or anything. We now have expanded our family again. We now have twins with special needs. The one is blind and has CP. I called asking about their policy on the pools and was told it didn't matter if it was a special need/disablity if the children weren't potty trained they couldn't go into the pools at all. How can I take them on a cruise with their sisters and tell them you can't go into the pool but your sisters can? Its discriminatory! They have told me there's no exceptions. The twins are 2. Having special needs and medical problems that you don't know if they'll potty train ever is not something we can change. The one twin absolutely loves the water and she's the one who is more handicapped. I think its wrong of Disney and I don't completely understand how its legal. This is why we haven't gone on another Disney Cruise. Now the theme park in Orlando we go to every year and spend over a week there. They are awesome and very very accomodating with our expanded family and special needs children. The Cruise Line not so much! Hotty "handicapped" is a antisocial word! In this day and age it is NOT okay to use that word. Normal decent people dont use the H word. It is NO better then the MR label. Shame on you- you should know better!! Get with the times please. Hotty there is a reason Disney Cruise dont allow children who arent potty trained into pools. Its to reduce the risk of poo in the pool and it is not discriminatory either. Nor is it unlegal. After they turn 13 they are no longer allowed in the clubs regardless of the needs that the child has. We found this out on our last Disney Cruise. It broke our heart to know that it would be our last one for a while considering the policy's that they have. But we respect that they have to adhere to what corporate says. I would, however, recommend a Disney to cruise to any family regardless of needs. 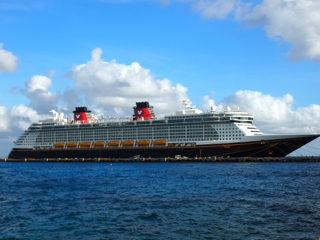 Your blog was very interesting and helpful as we were considering a Disney Cruise next year. However, after reading the comments, I don't think this will work out for us. We have a (soon to be) 18 year old daughter who uses a wheelchair due to her Leukodystrophy condition. She is incontinent and uses (diapers). While she is 18 years old, she truly enjoys more childlike activites and loves the Disney Princesses. She would not be able to attend the 'clubs' or use the swimming pools. Suddenly doesn't sound like near as much fun. Sad that special needs children (and their families) are so limited on vacation choices. you are so kind for letting the world know all these valuable tips and advises. Ellen this is so reassuring. I know you said a Disney Cruise would be awesome but now I am actually excited. Travelling with May is so unpredictable, and the info here is really helpful. Also - I'm buying May Max's headphones for her birthday this week. I saw the link in this post. I've been online today looking for them - so this helped me twice over. Thx! Thank you for your review. I was a little nervous about Christian's first cruise. (he's four with sensory issues), but after your review I think it will be ok. Maybe I should get him earphones too. I have always enjoyed/appreciated your posts about Max’s adventures! I am catching up on this one because I’m considering a cruise, as we went to Aulani in Hawaii this past Christmas, and I could not have been more pleased! The characters are “on vacation” in Hawaii, as well. It’s a less formal arrangement to meet and greet but I can tell you for certain my youngest (who has autism) LOVED seeing the characters. Even better: the Disney characters have an innate sense that their guest has extra needs. They are patient and loving and kind and it made this old worn down Autism Mom of two tear up over the experience (and we are decidedly NOT Disney World people). HIGHLY recommend a trip to Oahu Aulani and stay at a property nearby for sanity’s sake (the Aulani is way too much overwhelming sensory overload).